Buddha--the flower of mankind, is no more in this world, but the sweet fragrance of His peace message remains forever. 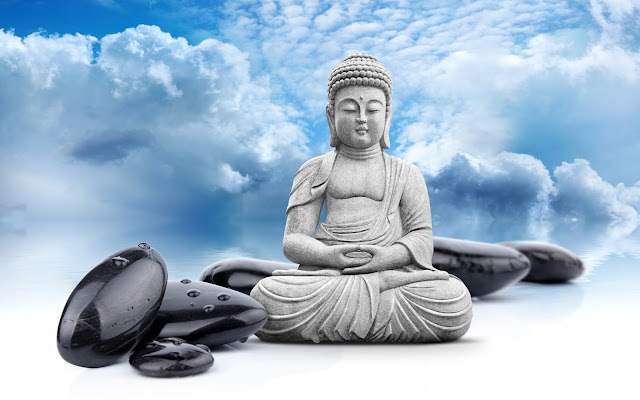 Buddhism is one of the oldest religions still being practised in the world today. While the names of many other religions which existed in India have been forgotten today, the teachings of the Buddha, (better known as the Dhamma) are still relevant to the needs of today's society. This is because the Buddha has always considered himself as human religious teacher whose message was meant to promote the happiness and well-being of other human beings. The Buddha's primary concern was to help His followers to live a normal life without either going to the extremes of self-denial or totally surrendering to sensual desires. The practical nature of the Buddha's teaching is revealed in the fact that not everyone is expected to attain exactly the same goal in one lifetime, since the mental impurities are deeply rooted. Some people are spiritually more advanced than others and they can proceed to greater heights according to their state of development. But every single human being has the ultimate potential to attain the supreme goal of Buddhahood if he has the determination and will to do so. Even now does the soft, sweet voice of the Buddha ring in our ears. And sometimes we perhaps feel a little ashamed because we do not understand Him fully. Often we only praise His Teaching and respect Him, but do not try to practise what He preached. The Buddha's Teaching and message have had their effect on all people for thousands of years whether they believe in religion or not. His message is for all. Though the Buddha, the flower of mankind, is no longer in this world, the sweet fragrance and exquisite aroma of His Teachings have spread far and wide. Its balmy, diffusing fragrance has calmed and soothed millions. Its ambrosial perfume has heartened and cheered every nation which it has penetrated. The reason that His Teachings have captured millions of hearts is because they were spread(not by weapons or political power)but by love and compassion for humanity. Not a drop of blood stains its pure path. Buddhism wins by the warm touch of love, not by the cold claws of fear. Fear of the supernatural and the doctrine of everlasting hell-fire have no place in Buddhism. During the last 25 centuries since the appearance of the Buddha, many changes have taken place in this world. Kingdoms have risen and fallen; nations have prospered and perished. However, the world today has forgotten many of these past civilizations. But the name of the Buddha remains alive and fresh in the minds of millions of people today. The Kingdom of Righteousness that He built is still strong and steady. Although many temples, pagodas, images, libraries and other religious symbols erected in His honor were destroyed, His untainted Noble Name and the message He gave remain in the minds of cultured people. The Buddha taught man that the greatest of conquests was not the subjugation of others but of the self. He taught in theDhammapada, 'Even though a man conquers ten thousand men in battle, he who conquers but himself is the greatest of conquerors'. Perhaps the best example of how the gentle message of the Compassionate One could rehabilitate the most savage of men is the case of the Emperor Asoka. About two hundred years after the Buddha, this king waged fierce battles across India and caused great anguish and fear. But when he absorbed the Dhamma, he regretted the evil that he had done. We remember and honor him today because after his conversion to the path of peace, he embarked on another battle: a battle to bring peace to mankind. He proved without doubt that the Buddha was right when He asserted that true greatness springs from love, not hatred, from humility, not pride; from compassion, not cruelty. The Emperor Asoka's conversion from cruelty to kindness was so complete that he forbade even the killing of animals in his kingdom. He realized that his subjects stole because of want and he set out to reduce want in his kingdom. But above all, he instructed the followers of the Buddha to remember the Master's teaching never to force their beliefs on others who were loyal to other religious leaders. In other cases we have heard of kings who, upon conversion, diverted their thirst for blood by spreading their new religion by the sword! Only Buddhism can take pride in a king who has never been equaled in such greatness before or ever since. The Buddha's Teachings were introduced in order that societies could be cultured and civilized and live in peace and harmony. All of life's most difficult problems can be better understood if we but try to learn and practise His teachings. The Buddha's approach to the problems and suffering of mankind is straightforward and direct. The Buddha was the greatest conqueror the world has ever seen. He conquered the world with His infallible weapons of love and truth. His Teaching illuminates the Way for mankind to cross from a world of darkness, hatred, and suffering, to a new world of light, love and happiness.